A fresh take on the body items in TSL, with over 60 new skins! Doubling the appearance item content with in-character skins and integration into TSL's world. I have thoroughly tested this mod, and taken creative liberties with adding new items. 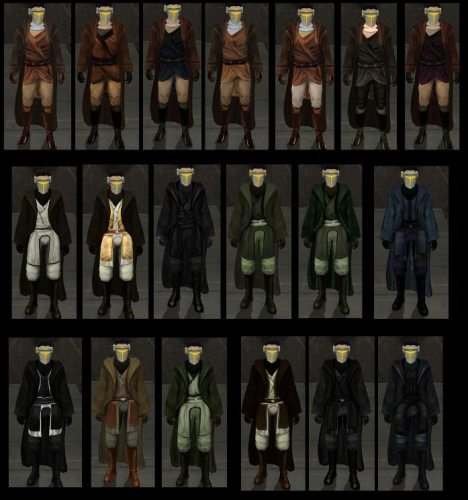 It was created to add life to TSL's selection of armors and robes. Requires a new game start to fully add everything, but some features will appear in your old saves. This mod is not primarily compatible with other mods, please know what you are installing and consult files before installing. Use the auto-generated Backup folder to replace files from the mod. You can also reset your Override folder (delete your override folder, make a new folder and name it override) Copy files from the mod archive in tslpatchdata (EXCEPT 2da FILES) into override and then hit delete while the mod files are still selected in override from being copied When in doubt, MAKE A BACKUP OF YOUR OVERRIDE FOLDER BEFORE INSTALLING (Just in case) -- although this is not necessary if you know what you're doing. Also please note this is close to being a total converison of items for TSL and will not function correctly with other appearance mods unless otherwise discovered on the user end. You are free to experiment with adding other appearance mods at your own risk. This mod adds a Jal Shey model armor that replaces the exile armband as the exile's item. The stats aren't too realistic but shouldn't be unreasonable. It is compatible with the New Bounty Hunters on Onderon mod, different new robe type mods, and TSLRCM/M4-78EP. For best use with TSLRCM, install TSLRCM, this mod, robe mods, and weapon/saber/other mods after that. Jal Shey replacements aren't recommended since this mod adds new default type Jal Shey armors. Copy mod files into your TSL Override folder. To uninstall, remove mod files from archive out of your Override folder. The mod requires a new game start to fully appear in-game. Otherwise, please install and use the giveitem code afterwards to get the item. It will replace the existing Exile armband item in TSL entirely, a trade-off. The item has a description, should reflect the player's name like the old Exile armband, and has an icon and male/female matching texture. The item uses the default Jal Shey/Zeison Sha armor type, and this mod does not include any additional replacement to the armor type. If you want multiple sets of this armor, you have to put in the giveitem code one time per set. This mod is compatible with Loot and Immersion Upgrade, TSLRCM, M4-78EP, and all mods except any M class armor (Jal shey/Zeison sha) replacement mod. This armor type is kept in character throughout its appearances in my mods, as with all the armors in the Loot and Immersion Upgrade. It can otherwise be found here, and on Azkul in Loot and Immersion Upgrade for a grand total of two dropped in TSL. This mod will add on to Loot and Immersion Upgrade, but is otherwise a standalone addition to TSL and won't add too much unrealistic or outside content on top of the default experience. Do not rerelease this mod on any site or in any way. 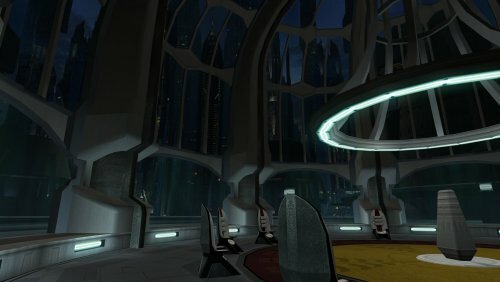 Adds a realistic Coruscant skybox to the Coruscant landing pad and council chambers. 1. put Override folder from archive into your SWKotOR2 folder in your program files directory. To Uninstall, remove mod files from your Override folder in TSL's program directory. as-is without alteration, unless by permission of me. This mod is not to be distributed for profit, either. I hereby state that I specifically do NOT wish this mod to be uploaded to Steam Workshop. I may release this on NexusMods at a later date but I don't wish others to do so. Usage in other mods must be requested and approved by me before your use. Adds bounty hunters to the exit sequence of Onderon. These NPCs are a fairly high difficulty fight and are placed at the end of the Onderon level. They have credits, weapons, and a new armor as rewards for defeating them. This new encounter is completely TSLRCM compatible. Those of you who have played my SUPER content mod may recognize this sequence. This is a TSLRCM compatible addon to the main Onderon quest, complete with credits and a new custom heavy armor reward. 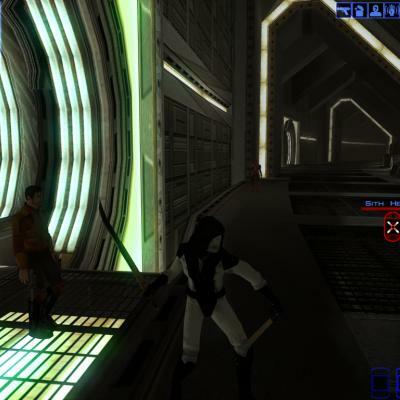 Copy Override folder from mod archive to your SWKotOR2 program directory to install. Please contact the original author for additional use and please use for personal use only. Contact 90SK via private message on deadlystream.com for any questions. Update 3/7 -- Fixed everything with the encounter, added the armored flight suit disguise reward with custom icon. Adds a new TSL themed armored flight suit item, a new encounter, and a new merchant and inventory on Onderon. The item is found as a reward for completeing Onderon. This mod will replace Gegorran with a new merchant, and add to the Onderon end sequence. This mod replaces Gegorran, and the HK-50s from TSLRCM at the end of Onderon. 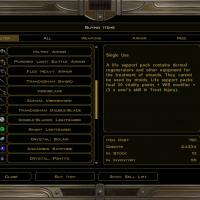 The characters also appear in loot&immersion upgrade and are an addon to Iziz. Do not redistribute this mod or release on a website at all. Any use other than personal use please contact the original authors for permissions. Adds a high quality texture to the Iridorian bounty hunter space suit. Note the screenshot is taken in K2, but this is for K1. The skin was made using content found in both games. To install, place mod files in your Override folder. To uninstall, remove N_spaceman_low.tga from your Override folder. This modification adds an improved and also shiny look to the current HK-47/HK-50/HK-51 textures, similar to the KotOR 1 HK-47 appearance. To Install, click the "Install.exe" icon and follow the instructions. To Uninstall, remove all files packaged within this mod from override except appearance.2da. If you experience issues with the mod, install this mod before starting a new game. This mod may not work retroactively with your saves depending on your pc settings and game settings. I have confirmed that this mod does work from HK-50s first encounter, but it may potentially present with transparent textures, due to necessary changes to appearance.2da not being made with the installer. You must use the exe installer in the mod archive to fully install the mod. Also, if you're installing TSLRCM and M4-78EP, install this mod after and also last. Please do not release this mod on other sites or use its content without contacting me first. This mod replaces all the cloaked heavy armor items from Loot& Immersion Upgrade with default Jal Shey model skins. All the old cloaked heavy armors are transformed into new Jal Shey armors, and default jal shey skins have been improved or reskinned. New items have new matching icons. Loot drops for the new items are optional and included in the second link listed in the downloads, along with replaced and new items files for the JS/ZS armors. The loot drops include many available through a new merchant replacing Gegorran, expanded loot drops on Nar Shaddaa (Vogga) and Korriban (tomb), Dxun (zakkeg), and the Uliq Qel-Droma armor replacement. This mod will patch Loot & Immersion Upgrade 2.0.7b items, if you patch loot 2.0.7 with this mod and want to go back to using loot&immersion cloaked heavy armors, reinstall loot and immersion upgrade. - Gegorran is replaced with a new merchant that sells 4 default JS/ZS reskins by 90SK and the original green/black/metal coattails, two ancient sith JS/ZS armors, and at two rare jedi ZS/JS armor. - A traveler on Telos will turn up dead hunting Zakkeg on Dxun. He has a powerful new JS/ZS armor. - The six default JS/ZS items in the random loot system have been replaced with Jedi ZS/JS armors. - On Dxun, the ritual sheilds locked in the secret temple are traditional Jedi JS/ZS armors. There is another of these armors in the Onderon museum. -Darth Malak's armor original is one of the default JS/ZS armors sold on Onderon. Its ranom loot item is not a new dark side JS/ZS armor. "giveitem a_robe_06" "a_robe_07" "a_robe_11" "a_robe_16" "a_robe_20" "a_robe_26"
"giveitem ajunta" & "giveitem shadow"
Do not release this mod in any way/shape/form. Please contact original author for additional use. Modification of the default Onderon skybox to be brighter. Appears in game with frame buffer effects activated. This mod doesn't run well without frame buffer effects enabled, aka the visual effects in TSL, in the graphics menu. Includes modified loading screens. This was an experiment for personal use that turned out well for me, so I decided to release it as a mod. I did this mod mainly because I was spending too much time on Onderon and got bored. Copy files from the mod archive to your Override folder. Please only use with permission/for personal use. Contact 90SK at deadlystream.com to request for additional use. DAMAGE CAUSED TO YOUR COMPUTER FOR THE USAGE OF THIS FILE. Making the randomly colored dark jedi DS only encounter more like an encounter with some of Darth Malak's elite killers. 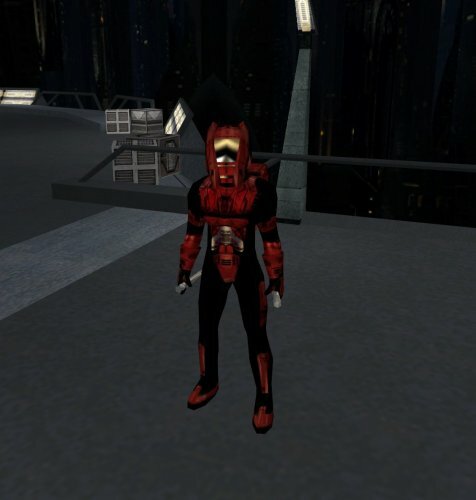 I have created disguise items for the new armor included via cheats, the DS encounter with the red/white/blue elite dark jedi will now be in matching uniforms and improved/custom skins by 90SK. There is no loot drop for the disguise, use the giveitem code. The encounter is DS only or depending on your choices you will see them. Stats have not been modified for the reskinned NPCs. Copy files from mod archive to your Override directory inside your Knights Of The Old Republic install folder. elite dark jedi armor - "giveitem elite"
Please do not rerelease this mod or release this mod on any website. Adds a LS star forge robe to Vogga's hoard on Nar Shaddaa along with some souvenirs. Item code "deluxe" for Star Forge robe. Conversation between Vogga and Hanharr will add the items, complete the Vogga's hoard quest. Do not skip the Vogga Hanharr cutscene at all or else mod may glitch. Use file copied to override for Loot/Immersion Compatibility from its respective folder. Many of you may remember the Star Forge robe in the original KotOR trailers. I have made them both available in-game, as a replacement for the armored flight suit. The SF is on Nar Shaddaa and the Revan tunic is on Korriban. Happy trails. Special thanks to LucasForums Knights of the Old Republic community for scripting tutorials. Special thanks to Fred Tetra for use of KotOR Tool. This modification for Star Wars KotOR II replaces the Jal Shey armor model with cloaked heavy armor. 10-11-17 - Repackaged mod and hopefully improved installation process. 1 Run tslpatcher.exe and select your Knights of the Old Republic II program directory in either your C:\Program Files\LucasArts or C:\Program Files\Steam\SteamApps\Common\ folder. 2 Alternately, place files from archive inside the "Override" folder in your Knights of the Old Republic II program directory. Versions can usually be copied over each other but you can only use one at a time. This mod may not be reproduced or rereleased without express permission from the authors. Cloaked Heavy Armors for Zeison Sha Armors Mod 2016.zip PAGE SCREENSHOT with male and female cloaks and armors. Includes ALL heavy armor cloak items from Loot & Immersion 2.0.7. Also includes Cortosis Force Armor and Onderon merchant. Cloaked Heavy Armor Females for Loot & Immersion 2.0.5.7z - Exactly as it says, adds a cloak to all female cloaked heavy armors for Loot & Immersion 2.0.7. 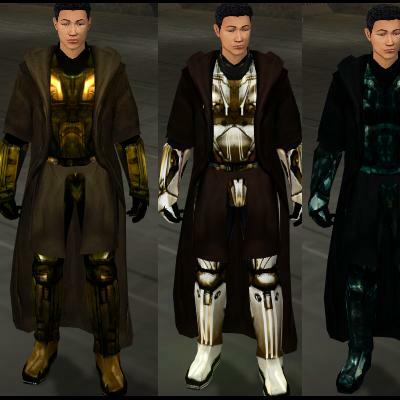 Description: reskins for the Jedi master robes, also including a replacement for all robes with the Jedi master model. I have done unique reskins for the default model to replace the endless copies from vanilla TSL. A few have been kept more or less the same but modified in other ways. Items will appear naturally in game, there is a also a new robe in the Onderon museum. There are options in the archive to install the Jedi Master robe model for all robes/as a replacement for the padawan robe model. With both parts there are multiple new master robes to replace the existing robes. -copy Override folder in mod archive to your Knights Of the Old Republic II directory (there should already be a folder called override there). -Alternatively, copy the mod files from the version you chose into the Override folder in your Knights Of the Old Republic 2 directory. *TSLRCM Compatibility: This mod will replace some files from TSLRCM, but it is fully compatible otherwise. Description: Replaces the default Sith mask item in TSL with a Kylo Ren mask. Includes a new inventory icon. Installation: copy files from mod archive to the "Override" folder in your TSL program directory. Notes: Please do not redistribute or release this mod independently without contacting me and getting permission first. Explicitly do not release this mod in any way/shape/form. Description: Adds a new type of force-friendly armor to TSL, exclusively sold by Onderon merchant replacing Gegorran. Also features some rare items in the merchant's inventory. This mod is an alternate version of "New Onderon Merchant" and is also included in "TSL Loot&Immersion Upgrade 2.0.4". Notes: This mod modifies the unused Restrictive Robe armor type, it will not conflict with the majority of other item mods, and acts as a standalone addon to the armor content in TSL. It also replaces the Gegorran merchant on Onderon. It is the same as "New Onderon Merchant" with the addition of the new armor. If installed after "TSL Loot&Immersion Upgrade 2.0.4" the merchant in Loot&Immersion Upgrade will be replaced by this version of the merchant. This mod is as-is content and not supported by Obsidian, Bioware, or LucasArts. It is meant for personal use only and at users own risk. 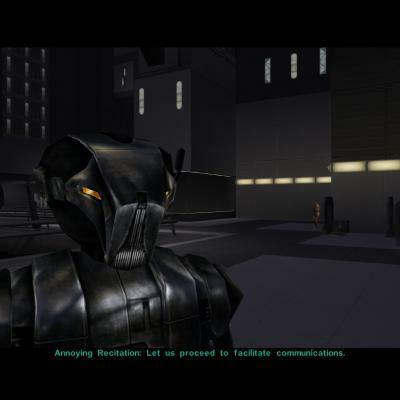 The devlopers of KOTOR and the author are not responsible for your computer or what you choose to do with it. 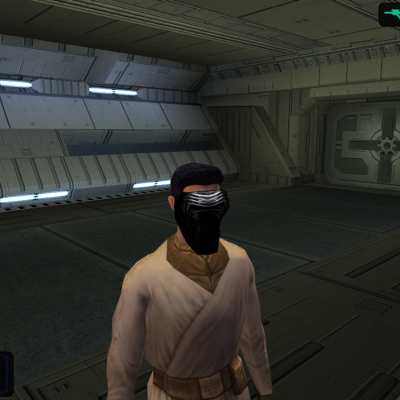 This mod replaces Darth Nihilus' default mask with a more stylistically accurate version similar to the mask depicted in the KotOR 2 concept art. 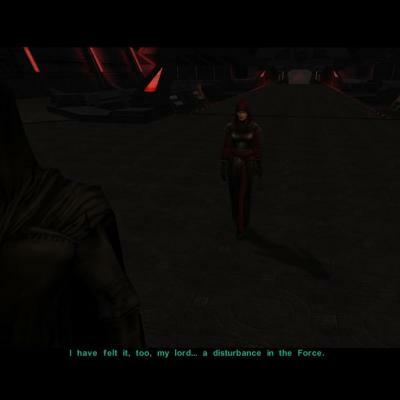 This mod will change the appearance of Darth Nihilus to the updated version in all in-game appearances he has. 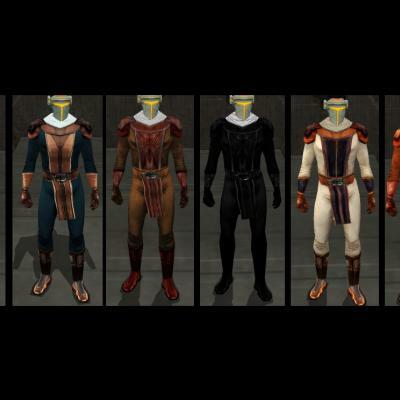 Description: This mod replaces the Jedi Robe type robes in Knights Of The Old Republic 2 with unused robes featured in KotOR 1 worn by Jedi NPCs. There are eight skins for this model including three defaults and five reskins that replace the old Jedi padawan robes. The female version uses Bastila's Jedi Robe model. Additional features include male and female Sith disguise and a unique tunic. I would recommend this for male players primarily. Installation: Put the files in your SWKotOR2/Override directory. Uninstall: Remove the files from the Override directory. This modification changes the default Mandalore appearance to that of a canonical Mandalore, complete with tribal facemask and Portrait icon. To install, copy the "Mandalore" folder into the Override folder within the SWKotor2 directory. To uninstall, remove the "Mandalore" folder from Override. 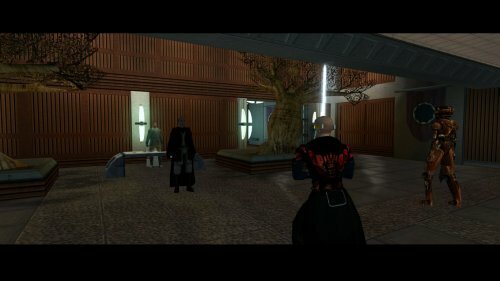 This mod features an originally unused NPC jedi robe, and the Bastila jedi robe model. The new models replace the old four Jedi Padawan robes. 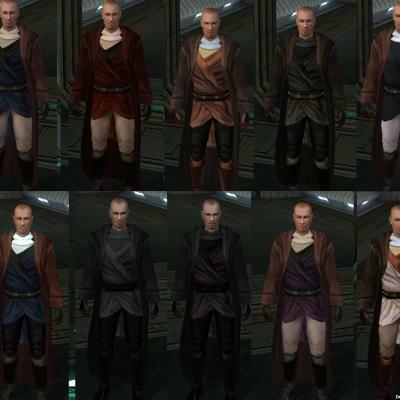 There are a total of 12 replacement robes that appear throughout Knights of The Old Republic. I have also included the old version in the pack in case you want to go on a nostalgia trip. To Install, place files in the SWKotOR2/Override directory. Remove the files from Override to uninstall. Two options with installation, either replace the padawan robe type, or fully replace all robes with cloaked KOTOR tunics. Complete with unique varieties for unique robes, there are a total of 18 options to choose from. Unique robe item icons have been included. To Install, run TSLpatcher.exe for either of the installation options, and be sure to save your auto-generated backup folder. Redistribution or reuse of this file in other projects is prohibited without permission from both authors. Special thanks to Fred Tetra, author of KOTOR Tool, and Obsidian / Bioware for their original material. Additional and extra special thanks to VarsityPuppet for his modeling efforts here. This mod is incompatible with other robe mods as it replaces all robe items and structures. Mods that replace the Jal Shey/Zeison Sha armor type will not be affected. For best results, use with a new game. 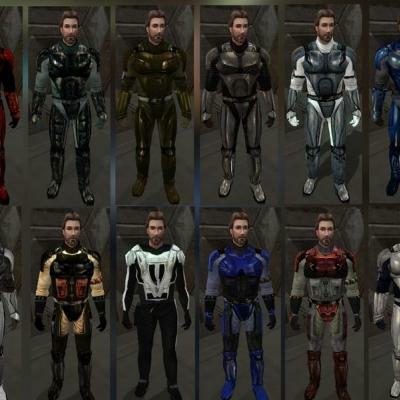 This KotOR 2 modification adds seven new heavy armors and modifies the textures of the remaining default heavy armors. The modifications on default armors and armor icons are for aesthetic continuity. Aesthetic modifications have been made to medium armors as well. The new heavy armors will replace existing items so as to incorporate them into the random loot system. The items replaced include items that have a specific character name like Bindo's Band, Circlet of Saresh, and Onasi Blaster. These items will now appear randomly as new heavy armors. Other new heavy armors have been added to bad-guy inventories or treasure loot, so as to be encountered by the player at specific intervals in the game's story. It is best to install before starting a new game. Adds a wealthy merchant to the main square of the Onderon module with the police tower and the news hologram. He will spawn after Vaklu and Tobin confer about the Exile being on Onderon. He is fully voiced by me.